Resting-state functional magnetic resonance imaging (fMRI) is emerging as an interesting biomarker for measuring connectivity of the brain in patients with Alzheimer's disease (AD). In this review, we discuss the origins of resting-state fMRI, common methodologies used to extract information from these four-dimensional fMRI scans, and important considerations for the analysis of these scans. Then we present the current state of knowledge in this area by summarizing various AD resting-state fMRI studies presented in the first section and end with a discussion of future developments and open questions in the field. Alzheimer's disease (AD) is a multifaceted disease in which cumulative pathological brain insults result in progressive cognitive decline that ultimately leads to dementia. Amyloid plaques, neurofibrillary tangles, and neurodegeneration are the well-established pathological hallmarks of AD. In addition to existing imaging biomarkers to measure each of these pathologies, resting-state functional magnetic resonance imaging (rs-fMRI) is an emerging AD biomarker that provides a non-invasive method to measure subtle functional changes in the brain. 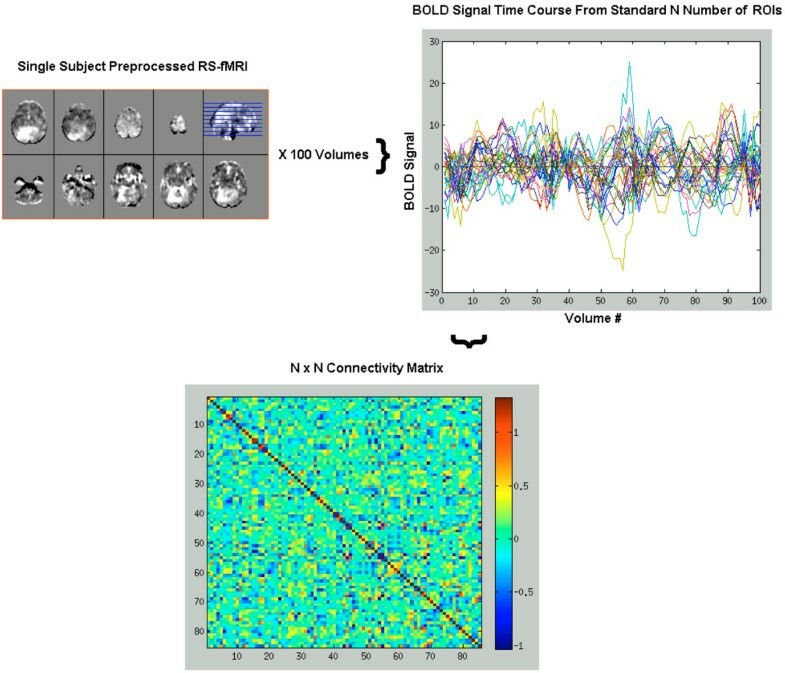 The most salient feature of rs-fMRI in AD is the ease of data acquisition in patients with dementia, specifically the ability to measure functional connectivity changes without requiring the performance of a task. Also, this MRI sequence can be obtained easily during routine clinical structural MRI sessions. This paper provides a review of rs-fMRI in AD and is divided into three sections: (a) the origins of rs-fMRI, methods that are widely used, and pitfalls that are typically seen in rs-fMRI studies; (b) the published resting-state literature in AD, and (c) a discussion of future developments and open questions in the field. Resting-state fMRI is a relatively recent addition to the tools used by the neuroscientific community to investigate the functional connectivity in the human brain. The foundations of functional connectivity began to emerge in the 1960s when neurophysiologists, who were studying action potential firing trains from single neurons, recognized the importance of characterizing the relationship of one neuron's firing pattern to other neurons firing at the same time . At its most rudimentary level, functional connectivity represents a measure of the correlated signal from two or more spatially distinct regions over time. Over the years, this concept has been applied to a variety of techniques used in neuroscience (for example, electroencephalography, magnetoencephalography, and corticography). However, it was not employed in fMRI until the 1990s , and not until 1995 did investigators first observe that low-frequency fluctuations (0.1 to 0.01 Hz) in the blood oxygen level-dependent (BOLD) signal were highly correlated within the motor cortex . These low-frequency fluctuations have since been shown to be specific to gray matter [3, 4] and can be used to identify the spatial extent of temporally correlated networks of structural and functional connectivity within the brain [5–9]. These large-scale networks are present at all times in the living human brain, and analysis of task-based fMRI experiments gives results similar to those of 'resting state' fMRI paradigms when subjects are not given a specific task . The importance of this finding cannot be understated and implies that large-scale networks of functional connectivity that are interrogated with task-based fMRI paradigms are the same networks interrogated during fMRI paradigms that do not have a specific task (that is, rs-fMRI). Task-based fMRI paradigms are likely interrogating a specific arrangement of the underlying large-scale networks of functional connectivity within the context of the experimental paradigm, whereas rs-fMRI studies interrogate these same networks without an experimentally determined context. The absence of a predetermined experimental task in rs-fMRI is the feature that led to the use of the moniker 'resting state' to describe this technique and the identified networks (that is, resting-state networks). However, given that these networks are present during tasks and that no brain is ever truly at 'rest', some investigators have offered the more accurate term of intrinsic connectivity networks (ICNs)  rather than resting-state networks. Use of the ICN moniker is gaining popularity and we will use this term for the remainder of the review. For the same reasons, we prefer the term task-free fMRI (TF-fMRI) rather than rs-fMRI. The absence of a predetermined experimental paradigm in TF-fMRI precludes the use of traditional fMRI methods for modeling the hemodynamic response related to experimentally isolated changes in the BOLD signal. Therefore, we will briefly review some of the most popular methods currently used to investigate ICNs in TF-fMRI and discuss potential confounds that these techniques are susceptible to before discussing the application of these techniques to studies related to AD. Several methods have been developed to extract the spatial and temporal extent of ICNs from TF-fMRI data [12, 13]. The dominant methodologies can be segregated into region of interest-based or seed-based correlation studies and data-driven multivariate analysis techniques, such as independent component analysis (ICA), and are described in detail here. Seed-based techniques have an a priori assumption that the node or region involved in the ICN is known and these regions are used to extract the low-frequency fluctuations in the BOLD signal used in further analysis. The seed regions may consist of individual voxels, small collections of voxels within a spheroid seed, or large functionally/anatomically derived regions of interest (for example, Brodmann areas). The low-frequency fluctuations within this defined seed or region can then be correlated with every other voxel in the brain in a voxel-wise exploratory analysis to understand the seed-to-brain connectivity (Figure 1a) or can be correlated only with another region or seed to analyze seed-to-seed connectivity. The sensory-motor ICN was first demonstrated in fMRI by using a seed-based methodology , as was the prominent ICN known as the default mode network (DMN)  (see section B, 'Task-free functional magnetic resonance imaging Alzheimer's disease studies'). An example of the positive correlations in a seed-to-brain analysis using a spheroid seed of 6-mm radius in the posterior cingulate - MNI (Montreal Neurological Institute) coordinates = (-3, -51, 24) - is shown in Figure 1a, and the negative correlations to the same seed are shown in Figure 2a. The task-negative network (TNN), also known as the default mode network (DMN), with both seed-based and low-dimensional independent component analysis (ICA) (20 components) in a group analysis of 341 elderly healthy control subjects. (a) Regions with positive correlations to a 6 mm-radius spherical seed in the posterior cingulate cortex. The approximate size and location are indicated with yellow circle. (b) Three independent components within the TNN as detected by ICA (red: anterior DMN; blue: posterior DMN; green: ventral DMN). The task-positive network (TPN) with both seed-based and low-dimensional independent component analysis (ICA) (20 components) in a group analysis of 341 elderly healthy control subjects. (a) Regions with negative correlations, also known as anti-correlations, to the same 6 mm-radius spherical seed in the posterior cingulate cortex used in Figure 1. The approximate size and location are indicated with yellow circle. (b) Four independent components within the TPN (red: salience network; blue: dorsal attention network; green: left executive control network; violet: right executive control network) that were detected using ICA. Alternatively, the correlations of the low-frequency fluctuations within a series of regions or seeds can be organized into a connectivity matrix (as shown in Figure 3) and subjected to graph theoretical or network analysis . Network analysis is a powerful tool that enables us to characterize the global as well as local functional connectivity characteristics of a group of nodes in the brain and provides us with a simple way to comprehensively compare the functional connectivity organization of the brain between patients and controls. The network metrics that can be characterized are thoroughly discussed in  and include functional segregation, integration, and resilience of the network to insult. Extracting low-frequency fluctuations in a single subject's preprocessed task-free functional magnetic resonance imaging (TF-fMRI) data within a series of seeds to be used in graph theoretical analyses. (Top left) One of 100 representative volumes of a subject's preprocessed TF-fMRI data. (Top right) Time series from a collection of seed regions (also known as nodes in graph theoretical terms) demonstrating the typical low-frequency fluctuations in the blood oxygen level-dependent (BOLD) signal within each seed. (Bottom) Connectivity matrix (for example, adjacency, correlation, partial correlation, or covariance matrix) encoding the relationship between the signal within each seed to every other seed. This connectivity matrix can then be subjected to graph theoretical analyses. ROI, region of interest; RS-fMRI, resting-state functional magnetic resonance imaging. ICA is a data-driven multivariate analysis method that can be used to separate any multivariate signal into subcomponents that are mutually statistically independent. Since the fMRI signal observed is a summation of signals from multiple independent networks (ICNs) in the brain, ICA is ideally suited to separate each of the ICNs. ICA does not necessitate the a priori definition of regions from which low-frequency fluctuations are to be extracted and can extract ICNs by determining the maximal spatial and temporal independence of signals in the TF-fMRI data. This can be done at both the subject and group levels . Examples of several ICNs that were identified as independent components at the group level in the same data used in the seed analyses are displayed in Figures 1b and 2b. These group-level ICNs can then be used to back-reconstruct individual subject ICNs . All of these analyses necessitate several preprocessing steps to avoid signal contamination from non-neuronal sources of fluctuations in the signal time course, most prominently from movement and low-frequency oscillations induced from the cardiac and respiratory cycle . Regressing out nuisance covariates (that is, bulk head motion parameters, white matter signal, cerebrospinal fluid signal, and global signal) from the signal time courses attempts to deal with these confounds . However, bulk head motion may remain as a significant confound, specifically in patients with dementia; therefore, scanning sessions contaminated by significant motion are typically excluded from subsequent analysis. Removal of global mean signal improves the specificity of connectivity analysis  and is an attractive alternative to using physiologic cardiac and respiratory inputs as regressors  for reducing spurious direct correlations when MRI-compatible physiologic measuring systems are not available. This is necessary because gray matter has a capillary density significantly greater than that of white matter  and this variability is not accounted for by cerebral spinal fluid and white matter regression alone . However, this increases the regions that have negative correlations or so-called 'anti-correlations' as the mean value for all voxels at every time point will be zero . Figure 1a shows the positive correlations, and Figure 2a shows the negative correlations (that is, anti-correlations). Surprisingly, the regions that are anti-correlated are consistent within and between subjects for any given seed; however, the physiologic meaning of this relationship remains uncertain. This relationship is most prominent between regions defined as the task-positive network and the task-negative network . Subregions within both of these anti-correlated ICNs seen in the seed analysis are identifiable with ICA applied to the same data (Figures 1b and 2b). The growth and development of ICNs have been observed through infancy into adulthood [9, 24–26]. In addition, group comparisons of functional connectivity between young adults and the elderly in two nodes of the DMN have demonstrated age-associated disconnection of anterior to posterior regions . Also, a recent publication of a large multicenter cohort analyzed with both seed-based voxel-wise methods and ICA has demonstrated a significant age and gender effect on connectivity . These studies suggest that there is a significant amount of change within ICN throughout the lifespan. Work from our lab recently demonstrated that the age effect on ICNs is accelerated in AD, further emphasizing the importance of understanding and accounting for the effect of age on TF-fMRI investigations of neurodegenerative illnesses . Theoretically, the total or maximum number of ICNs is not deterministic in every human brain; therefore, setting the total number of independent components (or networks) that need to be extracted using ICA is ambiguous. If the number of independent components is set lower than the total number of ICNs in the brain, multiple ICNs might be fused together and not be well separated. On the other hand, specifying a larger number of independent components may split the existing ICNs into two or more subsystems (as shown by different ICNs detected by different colors in Figures 1b and 2b). While this remains an open question, recent studies have suggested that 20 independent components may be a reasonable assumption . An additional point to note while looking at the networks from an ICA is that some components may contain artifacts that can be used to denoise subsequent analyses . As mentioned above, rs-fMRI or TF-fMRI is becoming increasingly popular in the field of AD biomarkers. In this section, we present various published studies that have used the methods discussed in section A. We have broadly categorized the various TF-fMRI studies in AD and mild cognitive impairment (MCI) (prodromal stage of AD) into six groups and discuss the current state of knowledge in each of these. Functional imaging studies using positron emission tomography (PET) as well as fMRI have repeatedly observed the presence of deactivation in consistent brain regions in response to a task. This observation, along with the fact that the same regions have higher blood flow and oxygen consumption at rest, led to the conclusion that specific regions have higher baseline activity that is turned off during any task-induced state . These regions include the posterior cingulate, precuneus, medial prefrontal cortex and the hippocampus and are thought to be part of a DMN . The first studies in this area showed that there is decreased precuneus deactivation during tasks  and decreased DMN connectivity  in AD. Since the regions in the DMN (specifically, the hippocampus) are related to episodic memory, DMN is the most studied network in AD . Studies have also shown decreased functional synchrony in the hippocampus  and reduced connectivity of the hippocampus to the rest of the DMN . As mentioned above, several consistent ICNs other than the DMN operate synchronously in the resting brain (for example, motor function, visual processing, executive functioning, auditory processing, and episodic memory). Sorg and colleagues  were the first to study eight consistent networks in subjects with increased risk for AD by using ICA and found that two networks, namely the DMN and executive attention, had significantly reduced connectivity in patients with amnestic MCI when compared with cognitively normal (CN) subjects. Several task-associated studies have also investigated the effect of AD on several components of the memory networks - a key domain affected in AD [37–39]. As a heteromodal region - a hub for the majority of the information processing in the brain and a region of significant hypometabolism and amyloid deposition in AD - precuneus/posterior cingulate (PPC) is the most studied region in fMRI AD studies . There has been evidence that disease-related regional coherence of the region is decreased  and that functional disconnection of this region precedes atrophy . Whereas some studies have shown reduced connectivity of this region to the brain early in the disease process [43, 44], others have found notable increased connectivity [43, 45–47]. Recent papers have also been trying to investigate whether the PPC connectivity changes are due to regional pathology. Frings and colleagues  found that patients with early frontotemporal dementia have PPC connectivity changes similar to those of patients with AD or MCI, suggesting that PPC disconnection is a function of a lack of connectivity and not local pathology. Mormino and colleagues  found that, even though DMN is altered by increasing global amyloid levels, there was little effect of regional amyloid levels on regional functional connectivity. Different studies have used different methodologies that are quantitatively dissimilar and have used different populations to investigate this question, making it difficult to interpret the overall effect of AD on network connectivity. However, recently, the field has been moving toward the understanding that there is reduced DMN connectivity posteriorly with concomitant frontal lobe increases in the DMN  and the salience network [50, 51]. The interpretation of these reciprocal changes is a matter of ongoing investigation . However, we have found that this pattern is technique-independent and correlates with cognitive function , which suggests that both the increases and decreases in connectivity may be signs of ICN disorganization due to AD. However, this AD-related network disorganization may be modified with disease progression, as demonstrated by two recent longitudinal studies that found that the increased connectivity was present early in the diseases course but declines in later stages [53, 54]. Seed-based network detection (such as seed-to-brain connectivity) and ICA-based network detection are limited since they can be used to study specific networks based on a priori knowledge. For this reason, large-scale network analyses are becoming increasingly popular to investigate the functional connectivity across the entire brain in an unbiased fashion. The simplest large-scale network analyses have used the 116 anatomically defined regions in the Automated Anatomical Labeling (AAL) atlas  and estimated correlations between any two regions to obtain a connectivity matrix of 116 × 116 that represents connectivity between all gross anatomical regions of the brain (similar to the example shown in Figure 3). Wang and colleagues showed that there is decreased anterior-posterior disconnection in AD on the basis of these 116 × 116 correlation matrices  and that correlations between 22 of the task-positive and task-negative regions can be used to distinguish patients with AD from CN patients with an accuracy of 83% . Studies have also used these matrices and found patterns of abnormal interregional correlations in widely dispersed brain areas in amnestic MCIs [58, 59]. Furthermore, the information in these matrices can be condensed into global connectivity measures by using graph theory and network analysis (as mentioned above) and can be applied to detect the disruption in the organization of the functional brain networks in AD (as presented in [60, 61]). Supekar and colleagues  found that there is disruption of local connectivity in the brain (specifically, in the hippocampus) reflected by low-clustering coefficients in AD when compared with CN subjects. Sanz-Arigita and colleagues  found, on the other hand, that the primary effect of AD was on the decreased long-distance connectivity of the frontal and caudal brain regions. Until recently, anatomically defined regions have been used to investigate large-scale networks of the brain. However, using anatomically defined regions has the following drawbacks: (a) the brain has a complex functional architecture and the functional units are smaller in size, making spatial averaging of time courses over large structural anatomy very unreliable; and (b) anatomical regions of interest may not always correspond to the functional organization of networks. Therefore, the field is moving toward finer sampling of the fMRI scans [40, 62] and using functionally defined regions  to obtain a better picture of the local and global functional changes. Apolipoprotein E (APOE) ε4 is the most important known genetic risk factor for typical late-onset AD. The lifetime risk of developing AD is increased and the age of onset of the disease is decreased with increasing number of APOE ε4 alleles . Studies have shown that APOE ε4 carriers and non-carriers have dissimilar functional connectivity networks in younger adults  as well as older adults [51, 66]. In a recent study, Sheline and colleagues  showed that there is altered connectivity in APOE ε4 carriers before the onset of amyloid plaque formation, suggesting that the genetic effect of APOE is seen even before any pathological changes. These studies suggest that it is important to take into account the functional architecture differences due to genetics. Amyloid deposition is widely believed to be an early process in AD and by itself does not directly cause clinical symptoms . Pittsburgh compound B (PIB) PET scans have commonly been used as a surrogate for amyloid deposition  in recent fMRI AD studies. Recent literature has consistently shown that there is a disruption of functional connectivity (especially, DMN) in subjects with amyloid deposition but no cognitive impairment [43, 44, 49, 70–72]. However, whether these early changes to the functional architecture are a compensatory mechanism to amyloid toxicity or a cause of amyloid deposition needs to be further investigated . At present, AD biomarkers have not yet been validated as surrogate endpoints for regulatory purposes and therefore cannot be used as the primary indicators of efficacy. However, there is a search for biomarkers that are non-invasive (to use for serial measurements) as well as sensitive (to perform clinical trials with smaller sample sizes). fMRI has always been viewed as a potential candidate since it can capture subtle pharmacodynamic effects on brain connectivity. TF-fMRI is of particular interest since its effect size is 2.4 times better than that of encoding-associated fMRI techniques in distinguishing risk groups and much easier to set up on clinical scanners because no additional specialized hardware or software is needed . A recent study showed that TF-fMRI can detect the effect of symptomatic treatment for moderate AD over 6 months . Given that pathology does not always map onto the clinical expression of the disease and has considerable clinical heterogeneity, biomarkers (such as TF-fMRI) that can provide information about the various functional networks may aid in the differential diagnosis of dementia types. Functional deactivation  and rs-fMRI differences  have been shown to be different between subjects with dementia with Lewy bodies and AD. While Frings and colleagues  showed that patients with early frontotemporal dementia have PPC connectivity changes similar to those of patients with AD or MCI, Zhou and colleagues  showed that subjects with frontotemporal dementia have reduced salience network activity and increased DMN activity, which is exactly the opposite of the AD effect. The apparent discrepancy between these two studies highlights the importance of understanding the differences between task-induced deactivations in a network and task-free measure of within-network functional connectivity, and one should not conclude that the same networks are targeted in AD and frontotemporal dementia. As suggested by Seeley and colleagues , different syndromic atrophy foci may be related to the disruption of different large-scale networks and TF-fMRI may aid in both making a differential diagnosis as well as distinguishing the disease mechanisms of different dementias. TF-fMRI can potentially add value to clinical assessment since it is an independent non-invasive measure of neuronal activity that cannot be captured by using structural brain scans. TF-fMRI has the potential to play several key roles in AD: making an early diagnosis, predicting future progression of disease, and measuring the efficacy of therapeutics and progression of disease. However, there are still issues that need to be systematically solved before TF-fMRI is ready for clinical applications. Some of the necessary future developments in the field of TF-fMRI are (a) standardization of preprocessing methods for TF-fMRI scans, (b) development of analysis methodologies to extract information from TF-fMRI scans so that the measures are sensitive to detecting small functional changes and have good reproducibility, and (c) establishment of large population-based TF-fMRI databases to evaluate the variability and stability of large-scale networks in the general population. The above developments will aid us in answering some important open questions in the field of TF-fMRI in AD: Is there a consistent breakdown of the functional architecture in AD because of increasing pathology? Do functional changes occur before or after the pathological changes due to AD? That is, are functional changes a response to pathology or catalysts to AD-related pathological changes? If there is a specific signature of functional architecture for each dementia, how can these be applied to provide a robust differential diagnosis and aid the clinical diagnosis of patients in the prodromal stages of dementia? task-free functional magnetic resonance imaging. PV receives support from National Institute on Aging grant K99 AG37573 (as principal investigator) and an Alzheimer's Association New Investigator Research Grant. CRJ receives support from National Institute on Aging grants R01 AG11378 (as principal investigator), P50-AG16574 (as co-investigator), and U01 AG024904-01 (as co-investigator) and the Alexander Family Alzheimer's Disease Research Professorship of the Mayo Foundation. CRJ serves on scientific advisory boards for Elan Corporation/Janssen Alzheimer Immunotherapy (Dublin, Ireland), Eli Lilly and Company (Indianapolis, IN, USA), GE Healthcare (Little Chalfont, Buckinghamshire, UK), and Eisai Inc. (Woodcliff Lake, NJ, USA); receives research support from Baxter International Inc. (Deerfield, IL, USA), Allon Therapeutics Inc. (Vancouver, BC, Canada), and Pfizer Inc (New York, NY, USA); and holds stock/stock options in Johnson & Johnson (New Brunswick, NJ, USA). PV and DTJ declare that they have no competing interests.